Jersey in the Channel Islands is a mighty dog lovers paradise! Jersey is the biggest of the channel islands at nine by five miles and more importantly, it is a mighty dog lovers paradise! 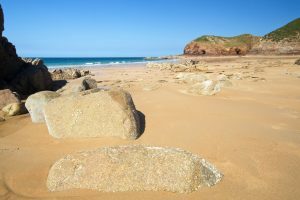 With flora and faunas galore, secluded wooded creeks, long golden sandy beaches, soaring cliff path walks, delicious local seafood and a wide-range of dog-friendly places, there really is something for everyone (and every dog!) on the island locals refer to as “The Rock”. 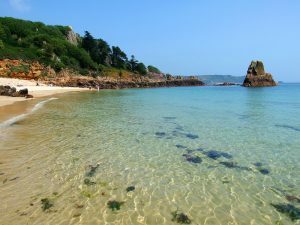 Lying just 14 miles off the French coast and 100 miles south of the British coast, you will find Jersey – a stunningly beautiful island with varied and unspoiled coastline comprising long sandy beaches, tiny coves and heather covered cliffs which slope down to picturesque bays and harbours. Given its close proximity to France but allegiance to the UK, it is a unique mix of both French and British cultural influence. The evidence of the island’s strong French influence is made apparent by the Brittany style landscapes, the French road and property names, as well as the style of many of Jersey’s homes and buildings landscapes. In addition, indigenous Jèrriais – a variety of Norman – was the language spoken until the 19th Century. During the 20th century, British cultural influence saw an intense language shift take place and Jersey today is predominantly English-speaking. Other British cultural influences on the island are evident in its use of the British pound as its currency, driving on the left, having access to the BBC and ITV regions and following the schools follow the English curriculum. For a small island, Jersey has a vastly colourful history. It has been home to Palaeolithic cave-living hunter gatherers; it was a Viking stronghold; it has been fought over back and forth by the English and French and it was occupied by the Germans during World War II. Jersey and the other Channel Islands were the only British territories to be occupied during the war and were finally liberated after five years on 9 May 1945 – one of the last places to be liberated in Europe. Jersey isn’t part of the United Kingdom, it’s a Crown dependency which means it’s a self-governing democracy under a constitutional monarchy, with its own financial, legal and judicial system, but that the UK is responsible for its defence. 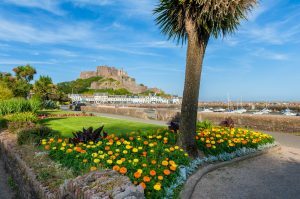 Jersey is, however, part of the British Isles, which consists of Great Britain, Ireland and over 6,000 smaller isles, and as such it is recorded to be the sunniest place in the British Isles. Jersey is well known for it’s exceptional quality of food and restaurants, so if you’re a dog-loving foodie, Jersey is a great place to live or visit. Locally caught fresh seafood is Jersey’s speciality; specifically, mussels (locally called “moules”), oysters, lobster and crabs – especially spider crabs – ormers and conger.  So, if you live in Jersey are are looking for a delicious meal venue to celebrate with friends, family or your other half (… and your dog); or you’re planning your next holiday in Jersey and would like to bring your best four-legged pal with you to this beautiful island – there is something to suit almost everyone on whizzDog.com – and best of all, all of our listings are dog-friendly! Search dog-friendly listings in Jersey here.